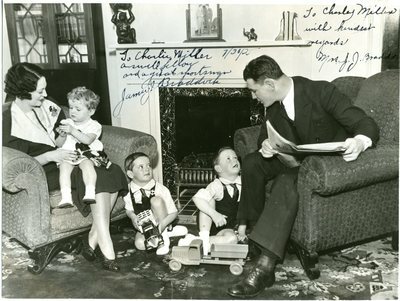 A black and white photograph signed, "To Charlie Miller, a swell fellow and a great sportsman, Jamie J. Braddock," and "To Charley Miller with kindest regards, Mrs. J. J. Braddock." The photo of the couple with their three children is stamped on the back," Note to Editors: Apr 18 1935, Under each reproduction of this picture must be carried the following credit: 'Associated Press Photo,' This picture may not be syndicated, rented or leased nor used for advertising purposes. The Associated Press." Rights assessment remains the responsibility of the researcher. Associated Press stipulations have been noted in the item description. For information about the process and fees for obtaining higher resolution scans or another file format, contact Special Collections.